Non-religious, Chinese folk religion (including Taoism, ancestral worship, Confucianism, and others), Mahayana Buddhism, Christianity, and other faiths. The Han Chinese, Hanzu, Han people (UK: /hæn/; US: /hɑːn/; Chinese: 漢人; pinyin: Hànrén; literally: 'Han people' or 漢族, pinyin: Hànzú, literally "Han ethnicity" or "Han ethnic group"), are an East Asian ethnic group and nation native to China. They constitute the world's largest ethnic group, making up about 18% of the global population. The estimated 1.3 billion Han Chinese people are mostly concentrated in mainland China (about 92% of the total population) and in Taiwan (about 95% of the population). Han Chinese people also make up three quarters of the total population of Singapore. The Han Chinese people trace a common ancestry to the Huaxia, a name for the initial confederation of agricultural tribes living along the Yellow River. The term Huaxia represents the collective neolithic confederation of agricultural tribes Hua and Xia who settled along the Central Plains around the middle and lower reaches of the Yellow River in northern China. The two tribes were the ancestors of the modern Han Chinese people that gave birth to Chinese civilization. In addition, the Huaxia (literally "the civilized Xia people") was distinctively used to represent the Huaxia as a civilized ethnic group in contrast to what was perceived of different ethnic groups as barbaric peoples around them. In many overseas Chinese communities, the term Hua Ren (华人; 華人; Huárén) may be used for people of Chinese ethnicity as distinct from Zhongguo Ren (中国人) which refers to citizens of China. The term Zhongguo Ren also includes people of non-Han ethnicity. Han people (汉人; 漢人; Hànrén) may also be used for people of ethnic Chinese descent around the world. The Han Chinese people are bound together with a common genetic stock and a shared history inhabiting an ancient ancestral territory spanning more than four thousand years, deeply rooted with many different cultural traditions and customs. The Huaxia tribes in northern China experienced a continuous expansion into southern China over the past two millennia. Huaxia culture spread from its heartland from the Yellow River Basin southward, absorbing various non-Chinese ethnic groups that became sinicised over the centuries at various points in China's history. The Han dynasty is considered to be the one of the first great eras in Chinese history as it made China the major regional power in East Asia and projected much of its influence on its neighbours while rivalling the Roman Empire in population size and geographical reach. The Han dynasty's prestige and prominence influenced many of the ancient Huaxia to begin identifying themselves as "The People of Han". To this day, Han Chinese people have since taken their ethnic name from this dynasty, and the Chinese script is referred to as "Han characters". The name Han was derived from the name of the eponymous dynasty, which succeeded the short-lived Qin dynasty, and is historically considered to be the first golden age of China's Imperial era due to the power and influence it projected over much of East Asia. As a result of the dynasty's prominence in inter-ethnic and pre-modern international influence, Chinese people began identifying themselves as the "people of Han" (Chinese: 漢人; pinyin: Hànrén), a name that has been carried down to this day. Similarly, the Chinese language also came to be named the "Han language" (traditional Chinese: 漢語; simplified Chinese: 汉语; pinyin: Hànyǔ) ever since. In the Oxford Dictionary, the Han are defined as "The dominant ethnic group in China". In the Encyclopedia of the Peoples of Asia and Oceania, the Han are called the dominant population in "China, as well as in Taiwan and Singapore." According to the Merriam-Webster Dictionary, the Han are "the Chinese peoples especially as distinguished from non-Chinese (such as Mongolian) elements in the population." The Han dynasty's founding emperor, Liu Bang, was made king of the Hanzhong region after the fall of the Qin dynasty, a title that was later shortened to "the King of Han" (漢王) during the Chu-Han contention. The name "Hanzhong", in turn, was derived from the Han River, which flows through the region's plains. The river, in turn, derives its name from expressions such as Tianhan (Chinese: 天漢, "the heavenly river"), Yinhan (Chinese: 銀漢, "the silver river"), Xinghan (Chinese: 星漢, "the star river") or Yunhan (Chinese: 雲漢, "the cloud river"), all ancient Chinese poetic nicknames for the Milky Way and first mentioned in the Classic of Poetry. Prior to the Han dynasty, ancient Chinese scholars used the term Huaxia (simplified Chinese: 华夏; traditional Chinese: 華夏; pinyin: Huá Xià, "the magnificent Xia") in texts to describe China proper as an area of illustrious prosperity and culture,[citation needed] while the Chinese populus were referred to as either the "various Hua" (諸華) or the "various Xia" (諸夏). This gave rise to a term commonly used nowadays by overseas Chinese as an ethnic identity for the Chinese diaspora – Huaren (simplified Chinese: 华人; traditional Chinese: 華人; pinyin: Huá Rén, "the Hua people"), Huaqiao (simplified Chinese: 华侨; traditional Chinese: 華僑; pinyin: Huáqiáo, "the Hua immigrant" meaning overseas Chinese) as well as a literary name for China – Zhonghua (simplified Chinese: 中华; traditional Chinese: 中華; pinyin: zhōnghuá, "the central Hua"). Zhonghua refers more to the culture of Chinese people, although it may also be seen as equivalent to Zhonghua minzu. The overseas Chinese use Huaren or Huaqiao instead of Zhongguoren (中国人), which refers to citizens of China. Among some southern Han Chinese varieties such as Cantonese, Hakka, and Minnan, a different term exists – Tang Chinese (Chinese: 唐人; pinyin: Táng Rén, literally "the people of Tang"), derived from the later Tang dynasty, regarded as another zenith of Chinese civilization. The term is used in everyday conversation and is also an element in the Cantonese word for Chinatown: "street of the Tang people" (Chinese: 唐人街; pinyin: Táng Rén Jiē; Jyutping: tong4 jan4 gaai1. The phrase Huá Bù 華埠 is also used to describe the same area). The vast majority of Han Chinese – over 1.2 billion– live in areas under the jurisdiction of the People's Republic of China (PRC), where they constitute about 92% of its population. Han Chinese in China have been a politically, culturally, and economically dominant majority vis-à-vis the non-Han minorities throughout most of China's recorded history. Han Chinese are the majority in every Chinese province, municipality, and autonomous region except for the autonomous regions of Xinjiang (45% in 2010) and Tibet (8% in 2014), where Uighurs and Tibetans are the majority, respectively. Ethnic Chinese also constitute the majority in both of the special administrative regions of the PRC – about 95% and 96% of the population of Hong Kong and Macau, respectively, but there is no statistics on the proportion of Han people. There are over 22 million Han Chinese in Taiwan; They began migrating from the southeastern coastal provinces of mainland China (especially from Fujian province) to Taiwan during the 13th to 17th century. [citation needed] At first, these migrants chose to settle in locations that bore a resemblance to the areas they had left behind in mainland China, regardless of whether they arrived in the north or south of Taiwan. Hoklo immigrants from Quanzhou settled in coastal regions, and those from Zhangzhou tended to gather on inland plains, while the Hakka inhabited hilly areas. Clashes between these groups over land, water, and cultural differences led to the relocation of some communities, and, as time passed, varying degrees of intermarriage and assimilation took place. In Taiwan, Han Chinese (including both the earlier Han Taiwanese settlers and the recent Mainland Chinese that arrived in Taiwan with Chiang Kai-shek in 1949) constitute over 95 percent of the population. They have also been a politically, culturally, and economically dominant majority vis-à-vis the non-Han aborigines. Elsewhere in the world, 3 million people of Chinese descent live in the United States (about 1% of the population), over 1 million in Canada (3.7%), over 1.3 million in Peru (4.3%),[citation needed] over 600,000 in Australia (3.5%), nearly 150,000 in New Zealand (3.7%), and as many as 750,000 in Africa. Because of the overwhelming numerical and cultural dominance of Han culture in China, most of the written history of China can be read as "a history of the Han Chinese", with only passing references to the ethnic minorities in China. The prehistory of the Han Chinese is closely intertwined with both archaeology, biology, historical textual records and mythology. The ethnic stock to which the Han Chinese originally trace their ancestry from were confederations of late neolithic and early bronze-age agricultural tribes known as the Huaxia that lived along the Guanzhong and Yellow River basins in Northern China. In addition, numerous ethnic groups were assimilated and absorbed by the Han Chinese at various points in China's history. Like many modern ethnic groups, the ethnogenesis of Han Chinese was a long and lengthy process that involved the expansion of the Chinese dynasties and their assimilation of various non-Chinese ethnic groups that became sinicised over the centuries. Writers during the Western Zhou and Han dynasties derived ancestral lineages based on Shang dynasty-era legendary materials, while the Han dynasty historian Sima Qian's Records of the Grand Historian places the reign of the Yellow Emperor (Chinese: 黃帝; pinyin: Huáng Dì), the legendary leader of Youxiong tribes (有熊氏), at the beginning of Chinese history. The Yellow Emperor is traditionally credited to have united with the neighbouring Shennong tribes (神農氏) after defeating their leader, Flame Emperor, (Chinese: 炎帝; pinyin: Yán Dì) at the Battle of Banquan. The newly merged Yanhuang (Chinese: 炎黃) tribes then combined forces to defeat their common enemy from the east, Chiyou (Chinese: 蚩尤; pinyin: Chì Yóu) of the Jiuli (九黎) tribes, at the Battle of Zhuolu, and established their cultural dominance in the Central Plain region. To this day, modern Han Chinese refer themselves as "Descendants of Yan and Huang" (simplified Chinese: 炎黄子孙; traditional Chinese: 炎黃子孫; pinyin: Yánhuáng Zǐsūn). Although study of this period of history is complicated by the absence of contemporary records, the discovery of archaeological sites has enabled a succession of neolithic cultures to be identified along the Yellow River. Along the central reaches of the Yellow River were the Jiahu culture (c. 7000 to 6600 BCE), the Yangshao culture (c. 5000 to 3000 BCE) and the Longshan culture (c. 3000 to 2000 BCE). Along the lower reaches of the river were the Qingliangang culture (c. 5400 to 4000 BCE), the Dawenkou culture (c. 4300 to 2500 BCE), and the Yueshi culture (c. 1900 to 1500 BCE). Early ancient Chinese history is largely legendary, consisting of mythical tales intertwined with sporadic annals written centuries to millennia later. Sima Qian's Records of the Grand Historian recorded a period following the Battle of Zhuolu, during the reign of successive generations of confederate overlords (Chinese: 共主) known as the Three Sovereigns and Five Emperors (c. 2852–2070 BCE), who, allegedly, were elected to power among the tribes. This is a period for which scant reliable archaeological evidence exists – these sovereigns are largely regarded as cultural heroes. The first dynasty to be described in Chinese historical records is the Xia dynasty (c. 2070–1600 BCE), established by Yu the Great after Emperor Shun abdicated leadership to reward Yu's work in taming the Great Flood. Yu's son, Qi, managed to not only install himself as the next ruler, but also dictated his sons as heirs by default, making the Xia dynasty the first in recorded history where genealogical succession was the norm. The civilizational prosperity of the Xia dynasty at this time is thought to have given rise to the name "Huaxia" (simplified Chinese: 华夏; traditional Chinese: 華夏; pinyin: Huá Xià, "the magnificent Xia"), a term that was used ubiquitously throughout history to define the Chinese nation. Conclusive archaeological evidence predating the 16th century BCE is, however, rarely available. Recent efforts of the Xia–Shang–Zhou Chronology Project drew the connection between the Erlitou culture and the Xia dynasty, but scholars could not reach a consensus regarding the reliability of such history. The Xia dynasty was overthrown after the Battle of Mingtiao, around 1600 BCE, by Cheng Tang, who established the Shang dynasty (c. 1600–1046 BCE). The earliest archaeological examples of Chinese writing date back to this period – from characters inscribed on oracle bones used for divination – but the well-developed characters hint at a much earlier origin of writing in China. The chaotic Warring States period of the Eastern Zhou dynasty came to an end with the unification of China by the western state of Qin after its conquest of all other rival states[when?] under King Ying Zheng. King Zheng then gave himself a new title "First Emperor of Qin" (Chinese: 秦始皇帝; pinyin: Qín Shǐ Huángdì), setting the precedent for the next two millennia. To consolidate administrative control over the newly conquered parts of the country, the First Emperor decreed a nationwide standardization of currency, writing scripts, and measurement units, to unify the country economically and culturally. He also ordered large-scale infrastructure projects such as the Great Wall, the Lingqu Canal and the Qin road system to militarily fortify the frontiers. In effect, he established a centralized bureaucratic state to replace the old feudal confederation system of preceding dynasties, making Qin the first imperial dynasty in Chinese history. This dynasty, sometimes phonetically spelt as the "Ch'in dynasty", has been proposed in the 17th century by Martin Martini and supported by later scholars such as Paul Pelliot and Berthold Laufer to be the etymological origin of the modern English word "China". The reign of the first imperial dynasty was to be short-lived. Due to the First Emperor's autocratic rule and his massive labor projects, which fomented rebellion among the populace, the Qin dynasty fell into chaos soon after his death. Under the corrupt rule of his son and successor Huhai, the Qin dynasty collapsed a mere three years later. The Han dynasty (206 BC–220 CE) then emerged from the ensuing civil wars and succeeded in establishing a much longer-lasting dynasty. It continued many of the institutions created by the Qin dynasty, but adopted a more moderate rule. Under the Han dynasty, arts and culture flourished, while the Han Empire expanded militarily in all directions. Many Chinese scholars such as Ho Ping-ti believe that the concept (ethnogenesis) of Han ethnicity, though an ancient one, was formally entrenched in the Han dynasty. The Han dynasty is considered one of the golden ages of Chinese history, and to this day, the modern Han Chinese people have since taken their ethnic name from this dynasty and the Chinese script is referred to as "Han characters". The fall of the Han dynasty was followed by an age of fragmentation and several centuries of disunity amid warfare among rival kingdoms. During this time, areas of northern China were overrun by various non-Han nomadic peoples, which came to establish kingdoms of their own, the most successful of which was Northern Wei (established by the Xianbei). Starting from this period, the native population of China proper began to be referred to as Hanren, or the "People of Han", to distinguish them from the nomads from the steppe. Warfare and invasion led to one of the first great migrations of Han populations in history, as they fled south to the Yangtze and beyond, shifting the Chinese demographic center and speeding up sinicization of the far south. At the same time most of the nomads in northern China came to be sinicized as they ruled over large Chinese populations and adopted elements of their culture and administration. Of note, the Xianbei rulers of Northern Wei ordered a policy of systematic sinicization, adopting Han surnames, institutions, and culture. The next few centuries saw successive invasions of Han and non-Han peoples from the north. In 1279, the Mongols conquered all of China, becoming the first non-Han ethnic group to do so, and established the Yuan dynasty. The Mongols divided society into four classes, with themselves occupying the top class and Han Chinese into the bottom two classes. Emigration, seen as disloyal to ancestors and ancestral land, was banned by the Song and Yuan dynasties. In 1644, the Ming capital, Beijing, was captured by Li Zicheng's peasant rebels and the Chongzhen Emperor committed suicide. The Manchus of the Qing dynasty then allied with former Ming general Wu Sangui and seized control of Beijing. Remnant Ming forces led by Koxinga fled to Taiwan and established the Kingdom of Tungning, which eventually capitulated to Qing forces in 1683. Taiwan, previously inhabited mostly by non-Han aborigines, was sinicized during this period via large-scale migration accompanied by assimilation, despite efforts by the Manchus to prevent this, as they found it difficult to maintain control over the island. In 1681, the Kangxi Emperor ordered construction of the Willow Palisade to prevent Han Chinese migration to the three northeastern provinces, which nevertheless had harbored a significant Chinese population for centuries, especially in the southern Liaodong area. The Manchus designated Jilin and Heilongjiang as the Manchu homeland, to which the Manchus could hypothetically escape and regroup if the Qing dynasty fell. Because of increasing Russian territorial encroachment and annexation of neighboring territory, the Qing later reversed its policy and allowed the consolidation of a demographic Han majority in northeast China. China is one of the world's oldest and most complex civilizations, whose culture dates back thousands of years. Overseas Han Chinese maintain cultural affinities to Chinese territories outside of their host locale through ancestor worship and clan associations, which often identify famous figures from Chinese history or myth as ancestors of current members. Such patriarchs include the Yellow Emperor and the Yan Emperor, who according to legend lived thousands of years ago and gave Han people the sobriquet "Descendants of Yan and Huang Emperor" (炎黃子孫; 炎黄子孙), a phrase which has reverberative connotations in a divisive political climate, as in that of between Mainland China and Taiwan. Zhang Zeduan's painting Along the River During the Qingming Festival captures the daily life of people from the Song dynasty at the capital, Bianjing, today's Kaifeng. Throughout the history of China, Chinese culture has been heavily influenced by Confucianism. Credited with shaping much of Chinese thought, Confucianism was the official philosophy throughout most of Imperial China's history, institutionalizing values like filial piety, which implied the performance of certain shared rituals. Thus, villagers lavished on funeral and wedding ceremonies that imitated the Confucian standards of the Emperors. Mastery of Confucian texts provided the primary criterion for entry into the imperial bureaucracy, but even those degree-holders who did not enter the bureaucracy or who left it held increased social influence in their home areas, contributing to the homogenizing of Han Chinese culture. Other factors contributing to the development of a shared Han culture included urbanization and geographically vast but integrated commodity markets. Han Chinese speak various forms of the Chinese language that are descended from a common early language; one of the names of the language groups is Hanyu (simplified Chinese: 汉语; traditional Chinese: 漢語), literally the "Han language". Similarly, Chinese characters, used to write the language, are called Hanzi (simplified Chinese: 汉字; traditional Chinese: 漢字), or "Han characters". In the late imperial period, more than two-thirds of the Han Chinese population used a variant of Mandarin Chinese as their native tongue. However, there was a larger variety of languages in certain areas of southeast China, like Shanghai, Guangzhou, and Guangxi. Since the Qin dynasty, which standardized the various forms of writing that existed in China, a standard literary Chinese had emerged with vocabulary and grammar that was significantly different from the various forms of spoken Chinese. A simplified and elaborated version of this written standard was used in business contracts, notes for Chinese opera, ritual texts for Chinese folk religion, and other daily documents for educated people. From the 1950s, Simplified Chinese characters were adopted in mainland China and later in Singapore and Malaysia, while Chinese communities in Hong Kong, Macau, Taiwan and overseas countries continue to use Traditional Chinese characters. [citation needed] Although significant differences exist between the two character sets, they are largely mutually intelligible. In China, the notion of hundred surnames (百家姓) is crucial identity point of Han people. A Song dynasty Chinese painting Night Revels of Han Xizai showing scholars in scholar's robes and musicians dressed in a Hanfu variant, 12th-century remake of a 10th-century original by Gu Hongzhong. Han Chinese families throughout China have had certain traditionally prescribed roles, such as the family head (家長, jiāzhǎng), who represents the family to the outside world, and the family manager (當家, dāngjiā), who is in charge of the revenues. Because farmland was commonly bought, sold, or mortgaged, families were run like enterprises, with set rules for the allocation (分家, fēnjiā) of pooled earnings and assets. Han Chinese houses differ from place to place. In Beijing, the whole family traditionally lived together in a large rectangle-shaped house called a siheyuan. Such houses had four rooms at the front – guest room, kitchen, lavatory, and servants' quarters. Across large double doors was a wing for the elderly in the family. This wing consisted of three rooms: a central room where the four tablets – heaven, earth, ancestor, and teacher – were worshipped, and two rooms attached to the left and right, which were bedrooms for the grandparents. The east wing of the house was inhabited by the eldest son and his family, while the west wing sheltered the second son and his family. Each wing had a veranda; some had a "sunroom" made with surrounding fabric and supported by a wooden or bamboo frame. Every wing was also built around a central courtyard that was used for study, exercise, or nature viewing. There is no specific one uniform cuisine of the Han people since the food eaten varies from Sichuan's famously spicy food to Guangdong's Dim Sum and fresh seafood. Analyses have revealed their main staple to be rice and noodles( different kinds of wheat foods ). During China's neolithic period, southwestern rice growers transitioned to millet from the northwest, when they could not find a suitable northwestern ecology – which was typically dry and cold – to sustain the generous yields of their staple as well as it did in other areas, such as along the eastern Chinese coast. Han Chinese have a rich history of classical literature dating back to three thousand years. Important early works include classic texts such as Classic of Poetry, Analects of Confucius, I Ching, Tao Te Ching, and the Art of War. 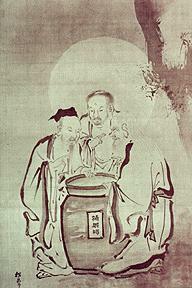 Some of the most important Han Chinese poets in the pre-modern era include Li Bai, Du Fu, and Su Dongpo. The most important novels in Chinese literature, otherwise known as the Four Great Classical Novels, are: Dream of the Red Chamber, Water Margin, Romance of the Three Kingdoms, and Journey to the West. Chinese literature continues to have an international reputation with Liu Cixin's San Ti series receiving international acclaim. Han Chinese have influenced and contributed to the development of human progress throughout history in many domains including the arts, culture, science and technology, business, social sciences and humanities, and sports, both historically and in the modern era. The invention of paper, printing, the compass, and gunpowder are celebrated in Chinese culture as the Four Great Inventions. Ancient Han Chinese astronomers were also among the first peoples to record observations of a cosmic supernova. The work of Chinese polymath Shen Kuo (1031–1095) of the Song dynasty theorized that the sun and moon were spherical and wrote of planetary motions such as retro gradation as well postulating theories for the processes of geological land formation. Chinese art, Chinese architecture, Chinese cuisine, Chinese literature, and Chinese philosophy all have undergone thousands of years of development, while numerous Chinese sites, such as the Great Wall of China and the Terracotta Army, are World Heritage Sites. Since the start of the program in 2001, aspects of Chinese culture have been listed by UNESCO as Masterpieces of the Oral and Intangible Heritage of Humanity. Throughout much of history, successive Chinese dynasties have exerted influence on their East Asian neighbors in the areas of religion, philosophy, education, language, politics, science and technology, business, and culture. In modern times, Han Chinese form the largest ethnic group in China, while an overseas Chinese diaspora numbering in the tens of millions has settled in and contributed to their host countries throughout the world. In modern times, Han Chinese continue to contribute to the progress of science and technology. Among them are Nobel Prize recipients Steven Chu, Samuel C.C. Ting, Chen Ning Yang, Tsung-Dao Lee, Yuan T. Lee, Daniel C. Tsui, Roger Y. Tsien, and Charles K. Kao (known as the "Godfather of Broadband" and "Father of Fiber Optics"); Fields Medal recipients Terence Tao and Shing-Tung Yau, and Turing Award recipient Andrew Yao. Tsien Hsue-shen was a prominent rocket scientist who helped to found NASA's Jet Propulsion Laboratory. Chien-Shiung Wu, nicknamed the "First Lady of Physics" contributed to the Manhattan Project and radically altered modern physical theory and changed the accepted view of the structure of the universe. Ching W. Tang was the inventor of the organic light-emitting diode (OLED) and hetero-junction organic photovoltaic cell (OPV) and is widely considered the "Father of Organic Electronics". Others include David Ho, one of the first scientists to propose that AIDS was caused by a virus, thus subsequently developing combination antiretroviral therapy to combat it. Dr. Ho was named Time Magazine Person of the Year in 1996. Min Chueh Chang was the co-inventor of the combined oral contraceptive pill and is known for his pioneering work and significant contributions to the development of in vitro fertilization at the Worcester Foundation for Experimental Biology. Tu Youyou is a prominent medical scientist and chemist who became the first native Chinese in history to receive the Nobel Prize in natural sciences when she received the 2015 Nobel Prize in Physiology or Medicine for discovering artemisinin (also known as qinghaosu) and dihydroartemisinin, used to treat malaria, which has saved millions of lives across the world. Choh Hao Li discovered human growth hormone (and subsequently used it to treat a form of dwarfism caused by growth hormone deficiency), beta-endorphin (the most powerful of the body's natural painkillers), follicle-stimulating hormone and luteinizing hormone (the key hormone used in fertility testing, an example is the ovulation home test). Joe Hin Tjio was a cytogeneticist renowned as the first person to recognize the normal number of human chromosomes, a breakthrough in karyotype genetics. Yuan-Cheng Fung, is regarded as the "Father of modern biomechanics" for pioneering the application of quantitative and analytical engineering principles to the study of the human body and disease. The geometer Shiing-Shen Chern was one of the leaders in differential geometry of the 20th century and was awarded the 1984 Wolf Prize in mathematics. China's system of "barefoot doctors" was among the most important inspirations for the World Health Organization conference in Alma Ata, Kazakhstan in 1978, and was hailed as a revolutionary breakthrough in international health ideology emphasizing primary health care and preventive medicine. Chinese folk religion is a set of worship traditions of the ethnic deities of the Han people. It involves the worship of various figures in Chinese mythology, folk heroes such as Guan Yu and Qu Yuan, mythological creatures such as the Chinese dragon, or family, clan and national ancestors. These practices vary from region to region, and do not characterize an organized religion, though many traditional Chinese holidays such as the Duanwu (or Dragon Boat) Festival, Qingming, and the Mid-Autumn Festival come from the most popular of these traditions. Taoism, another indigenous religion, is also widely practiced in both its folk forms and as an organized religion, and has influenced Chinese art, poetry, philosophy, medicine, astronomy, alchemy and chemistry, cuisine, martial arts, and architecture. Taoism was the state religion of the early Han Dynasty, and also often enjoyed state patronage under subsequent emperors and dynasties. In the Han Dynasty, Confucian ideals were the dominant ideology. Near the end of the dynasty, Buddhism entered China, later gaining popularity. Historically, Buddhism alternated between periods of state tolerance (and even patronage) and persecution. In its original form, Buddhism was at odds with the native Chinese religions, especially with the elite, as certain Buddhist values often conflicted with Chinese sensibilities. However, through centuries of assimilation, adaptation, and syncretism, Chinese Buddhism gained an accepted place in the culture. Mahayana would come to be influenced by Confucianism and Taoism, and exerted influence in turn – such as in the form of Neo-Confucianism. Map showing the expansion of Han dynasty in 2nd century BC. Vietnam, Guangdong, and Yunnan all experienced a major surge in Han Chinese migrants during Wang Mang's reign. :126 Hangzhou's coastal regions and the Yangtze valley were settled in the 4th century by Northern Chinese families from the nobility. :181 Special "commanderies of immigrants" and "white registers" were created for the massive number of Han Chinese of northern origin who moved south during the Eastern Jin dynasty. :182 The southern Chinese aristocracy was formed from the offspring of these migrants; Celestial Masters and the nobility of northern China subdued the aristocracy of southern China during the Eastern Jin and Western Jin, particularly in Jiangnan. With the depopulation of the north, due to this migration of northern Chinese, the south became the most populous region of China. Ming dynasty Han Chinese pirate Zheng Zhilong and his son Koxinga's ancestors in the Zheng family originated in northen China but due to the Uprising of the Five Barbarians and Disaster of Yongjia by the Five Barbarians, the Zheng family were among the northern Chinese refugees who fled to southern China and settled in Putian, Fujian. They later moved to Zhangzhou and moved on to Nan'an. Several wars in northern China such as the Uprising of the Five Barbarians, An Lushan Rebellion, Huang Chao Rebellion, the wars of the Five Dynasties and Ten Kingdoms and Jin–Song Wars caused a mass migration of Han Chinese from northern China to southern China called 衣冠南渡(yì guān nán dù). These mass migrations led to southern China's population growth, economic, agricultural and cultural development as it stayed peaceful unlike the north and the center of gravity of Chinese civilization and population shifted south. The first Ming dynasty emperor Zhu Yuanzhang resettled his home city Fengyang and capital Nanjing with people from Jiangnan. Y-chromosome haplogroup O2-M122 is a common DNA marker in Han Chinese, as it appeared in China in prehistoric times. It is found in more than 50% of Chinese males, and ranging up to over 80% in certain regional subgroups of the Han ethnicity. Other Y-DNA haplogroups that have been found with notable frequency in samples of Han Chinese include O-P203 (15/165 = 9.1%, 47/361 = 13.0%), C-M217 (10/168 = 6.0%, 27/361 = 7.5%, 187/1730 = 10.8%, 20/166 = 12.0%), N-M231 (6/166 = 3.6%, 18/361 = 5.0%, 117/1729 = 6.8%, 17/165 = 10.3%), O-M268(xM95, M176) (54/1147 = 4.7%, 8/168 = 4.8%, 23/361 = 6.4%, 12/166 = 7.2%), and Q-M242 (2/168 = 1.2%, 49/1729 = 2.8%, 12/361 = 3.3%, 48/1147 = 4.2%). However, the mitochondrial DNA (mtDNA) of Han Chinese increases in diversity as one looks from northern to southern China, which suggests that male migrants from northern China married with women from local peoples after arriving in modern-day Guangdong, Fujian, and other regions of southern China. Despite this, tests comparing the genetic profiles of northern Han, southern Han and southern natives determined that haplogroups O1b-M110, O2a1-M88 and O3d-M7, which are prevalent in southern natives, were only observed in some southern Han (4% on average), but not in northern Han. Therefore, this proves that the male contribution of southern natives in southern Han is limited, assuming that the frequency distribution of Y lineages in southern natives represents that before the expansion of Han culture that started two-thousand years ago. In contrast, there are consistent strong genetic similarities in the Y chromosome haplogroup distribution between the southern and northern Chinese population, and the result of principal component analysis indicates almost all Han populations form a tight cluster in their Y chromosome. However, other research has also shown that the paternal lineages Y-DNA O-M119, O-P201, O-P203 and O-M95 are found in both southern Han Chinese and South Chinese minorities, but more commonly in the latter. In fact, these paternal markers are in turn less frequent in northern Han Chinese. Another study puts Han Chinese into two groups: northern and southern Han Chinese, and it finds that the genetic characteristics of present-day northern Han Chinese was already formed as early as three-thousand years ago in the Central Plain area. The typicall y-DNA Haplogroups of Han Chinese are the Haplogroup O-M175 and Haplogroup Q-M242. ^ Of the 710,000 Chinese nationals living in Korea in 2016, 500,000 are ethnic Koreans. ^ Overseas Chinese include both Han and non-Han people (see overseas Chinese for related references). ^ Minahan, James B. (2014). Ethnic Groups of North, East, and Central Asia: An Encyclopedia. ABC-CLIO. pp. 89–95. ISBN 978-1-61069-018-8. ^ "Department of Statistics Malaysia Official Portal". Archived from the original on 2016-08-12. ^ "Race Reporting for the Asian Population by Selected Categories: 2010 more information". United States Census Bureau. Retrieved 19 January 2014. ^ Kewarganegaraan, Suku Bangsa, Agama dan Bahasa Sehari-hari Penduduk Indonesia Hasil Sensus Penduduk, 2010. Badan Pusat Statistik. 2011. ISBN 978-979-064-417-5. ^ "Home" (PDF). Archived from the original (PDF) on 2016-03-04. Retrieved 2015-10-21. ^ "The World Factbook". Archived from the original on 4 November 2010. Retrieved 17 February 2016. ^ Asia Pacific Foundation of Canada. "Population by Ethnic Origin by Province". Asia Pacific Foundation of Canada. Retrieved 17 February 2016. ^ a b c d e f g "The Ranking of Ethnic Chinese Population". Overseas Compatriot Affairs Commission, R.O.C. Archived from the original on 4 January 2011. Retrieved 23 September 2016. ^ "2016 Census QuickStats: Australia". quickstats.censusdata.abs.gov.au. Retrieved 31 October 2018. ^ "Población china en Venezuela". January 2019. Retrieved 7 January 2019. ^ "2011 Census: Ethnic group, local authorities in the United Kingdom". Office for National Statistics. 11 October 2013. Retrieved 13 April 2015. ^ Park, Yoon Jung (2009). Recent Chinese Migrations to South Africa – New Intersections of Race, Class and Ethnicity (PDF). Representation, Expression and Identity. Interdisciplinary Perspectives. ISBN 978-1-904710-81-3. Archived from the original (PDF) on December 28, 2010. Retrieved September 20, 2010. ^ "Cittadini Non Comunitari: Presenza, Nuovi Ingressi e Acquisizioni di Cittadinanza: Anni 2015–2016" (PDF). Istat.it. Retrieved 12 December 2017. ^ "BiB – Bundesinstitut für Bevölkerungsforschung – Pressemitteilungen – Zuwanderung aus außereuropäischen Ländern fast verdoppelt". Bib-demografiie.de (in German). Archived from the original on 9 December 2017. Retrieved 12 December 2017. ^ "Foreign national population in Korea up more than 40% in 5 yrs". Maeil Business News Korea. 8 September 2016. Retrieved 10 May 2018. ^ "Chinese living in Kingdom more than doubles since '17". 2018-09-14. Retrieved 15 September 2018. ^ "Cifras de Población a 1 de enero de 2016 : Estadística de Migraciones 2015 : Adquisiciones de Nacionalidad Española de Residentes 2015" (PDF). Ine.es (in Spanish). Retrieved 12 December 2017. ^ "2013 New Zealand Census". Retrieved May 13, 2018. ^ "Little China in Belgrade". BBC News. 2001-02-12. Retrieved 2010-05-04. ^ "Chinese-Mexicans celebrate repatriation to Mexico". The San Diego Union-Tribune. Nov 23, 2012. Retrieved Oct 8, 2017. ^ 2010 Chinese Spiritual Life Survey conducted by Dr. Yang Fenggang, Purdue University's Center on Religion and Chinese Society. Statistics published in: Katharina Wenzel-Teuber, David Strait. People's Republic of China: Religions and Churches Statistical Overview 2011 Archived 2016-03-03 at the Wayback Machine. Religions & Christianity in Today's China, Vol. II, 2012, No. 3, pp. 29–54, ISSN 2192-9289. ^ Who are the Chinese people? (in Chinese). Huayuqiao.org. Retrieved on 2013-04-26. ^ Fairbank, John K. (1983). The Cambridge History of China Volume 12: Republican China, 1912–1949, Part 1. Cambridge University Press. ISBN 978-1-139-05479-9. Retrieved May 20, 2016. ^ Wen; et al. (2004). "Genetic evidence supports demic diffusion of Han culture". Nature. 431 (7006): 302–05. Bibcode:2004Natur.431..302W. doi:10.1038/nature02878. PMID 15372031. ^ Stix, Gary (2008). "Traces of a Distant Past" Scientific American, July: 56–63. ^ "Han definition and meaning | Collins English Dictionary". www.collinsdictionary.com. Retrieved 2018-06-12. ^ "Han". Random House Webster's Unabridged Dictionary. ^ Kim, Hodong (2004). Holy War in China: The Muslim Rebellion and State in Chinese Central Asia, 1864–1877. Stanford University Press. p. 320. ISBN 978-0-8047-7364-5. Retrieved May 20, 2016. ^ Xiaobing Li; Patrick Fuliang Shan (2015). Ethnic China: Identity, Assimilation, and Resistance. Lexington Books. p. 69. ISBN 978-1-4985-0729-5. ^ Rawski, Evelyn S. (1998). The Last Emperors: A Social History of Qing Imperial Institutions. Stanford University Press. p. 2. ISBN 978-0-520-92679-0. ^ Ang, Khai C.; Ngu Mee S.; Reid P. Katherine; Teh S. Meh; Aida, Zamzuraida; Koh X.R. Danny; Berg, Arthur; Oppenheimer, Stephen; Salleh, Hood; Clyde M. Mahani; ZainMd M. Badrul; Canfield A. Victor; Cheng C. Keith (2012). "Skin Color Variation in Orang Asli Tribes of Peninsular Malaysia". PLoS ONE. 7 (8): 2. Bibcode:2012PLoSO...742752A. doi:10.1371/journal.pone.0042752. PMC 3418284. PMID 22912732. ^ Wang, Yuchen; Lu Dongsheng; Chung Yeun-Jun; Xu Shuhua (2018). "Genetic structure, divergence and admixture of Han Chinese, Japanese and Korean populations" (PDF). Hereditas. 155: 19. doi:10.1186/s41065-018-0057-5. PMC 5889524. PMID 29636655. ^ Chiang, Charleston (2017). "Map of Genetic Variation in Han Chinese" (PDF). p. 10. bioRxiv 162982. ^ Wang, Yuchen; Lu, Dongsheng; Chung, Yeun-Jun; Xu, Shuhua (2018). "Genetic structure, divergence and admixture of Han Chinese, Japanese and Korean populations". Hereditas (published April 6, 2018). 155: 19. doi:10.1186/s41065-018-0057-5. PMC 5889524. PMID 29636655. ^ Zhang, Feng; Su, Bing; Zhang, Ya-ping; Jin, Li (February 22, 2007). "Genetic Studies of Human Diversity in East Asia". Philosophical Transactions of the Royal Society B: Biological Sciences. 362 (1482): 987–996. doi:10.1098/rstb.2007.2028. PMC 2435565. PMID 17317646. ^ Zhao, Yong-Bin; Zhang, Ye; Zhang, Quan-Chao; Li, Hong-Jie; Cui, Ying-Qiu; Xu, Zhi; Jin, Li; Zhou, Hui; Zhu, Hong (2015). "Ancient DNA Reveals That the Genetic Structure of the Northern Han Chinese Was Shaped Prior to three-thousand Years Ago". PLoS ONE. 10 (5): e0125676. Bibcode:2015PLoSO..1025676Z. doi:10.1371/journal.pone.0125676. PMC 4418768. PMID 25938511. ^ Executive Yuan, R.O.C. (2014). The Republic of China Yearbook 2014 (PDF). p. 36. ISBN 978-986-04-2302-0. Retrieved 2016-06-11. ^ "Home" (PDF). Archived from the original (PDF) on 2016-02-16. Retrieved 2016-02-14. ^ a b Hui-Ching Chang; Richard Holt (2014-11-20). Language, Politics and Identity in Taiwan: Naming China. Routledge. pp. 162–64. ISBN 978-1-135-04635-4. ^ a b Sheng Lijun (2002). China and Taiwan: Cross-strait Relations Under Chen Shui-bian. Institute of Southeast Asian Studies. p. 53. ISBN 978-981-230-110-9. ^ a b Karl Hack; Kevin Blackburn (2012). War Memory and the Making of Modern Malaysia and Singapore. NUS Press. p. 96. ISBN 978-9971-69-599-6. ^ a b Eno, R. "The Han Dynasty (206 B.C. – A.D. 220)" (PDF). Indiana University Press: 1. ^ a b Schaefer (2008), p. 279. ^ Schaefer, Richard T. (2008). Encyclopedia of Race, Ethnicity, and Society. Sage Publications. p. 279. ISBN 978-1-4522-6586-5. Although the term han has its roots in the Han dynasty (206 BC–220 AD), which began around the Yellow River and then spread out, the concept really became nationalized early in this century. ^ Hsu, Cho-yun; Lagerwey, John (2012). Y.S. Cheng, Joseph, ed. China: A Religious State. Columbia University Press. p. 126. ^ "Definition of Han by Oxford". Oxforddictionaries.com. Retrieved 12 December 2017. ^ "Definition of Han by Merriam-Webster". Merriam-webster.com. Retrieved 12 December 2017. ^ a b Liu, Xingwu (2004). "Han". In Ember, Carol R.; Ember, Melvin. Encyclopedia of Medical Anthropology. Springer US. pp. 703–17. doi:10.1007/0-387-29905-X_73. ISBN 978-0-306-47754-6. The name "Han" was derived from the Han River, an upper tributary of the Yangtze River. It was further strengthened by the famous Han Empire (206 BC–220 AD) which lasted for several hundred years when the people began active interactions with the outside world. ^ Chua, Amy L. (2000). "The Paradox of Free Market Democracy: Rethinking Development Policy". Harvard International Law Journal. 41: 325. ^ "Taiwan Population (2017) – World Population Review". worldpopulationreview.com. Retrieved 2017-01-23. ^ a b Yim, Onn Siong (2005). Y chromosome diversity in Singaporean Han Chinese population subgroups (Master). National University of Singapore. ^ China and Africa: Stronger Economic Ties Mean More Migration, By Malia Politzer, Migration Information Source, August 2008. ^ a b Jacques, Martin (October 26, 2012). "A Point Of View: How China sees a multicultural world". BBC News. ^ West, Barbara A (2009). Encyclopedia of the Peoples of Asia and Oceania. ISBN 978-1-4381-1913-7. ^ "Common traits bind Jews and Chinese". Asia Times Online. Jan 10, 2014. Retrieved 23 September 2015. ^ "Xia Dynasty". Archived from the original on 2014-03-08. ^ "Han Ethnic Group, Facts about Chinese Han, Han People China". Tripchinaguide.com. Retrieved 12 December 2017. ^ a b c "Free Resources: Country Profile and Demographics – The Han People of China". 25 December 2008. Archived from the original on 25 December 2008. ^ a b Theobald, Ulrich. "The Feudal State of Wu 吳 (www.chinaknowledge.de)". Chinaknowledge.de. Retrieved 12 December 2017. ^ "China The Zhou Period". Ancienthistory.about.com. Retrieved 12 December 2017. ^ a b "China The Zhou Period". Lcweb2.loc.gov. Retrieved 12 December 2017. ^ "Clayton D. Brown Research on Chinese History: Ethnology, Archaeology, and Han Identity". Claytonbrown.org. Retrieved 12 December 2017. ^ Nyíri, Pál; Rostislavovich Savelʹev, Igorʹ (2002). Globalizing Chinese migration: trends in Europe and Asia. Ashgate Publishing, Ltd. p. 208. ISBN 978-0-7546-1793-8. ^ Shaorong Yang (2004). Traditional Chinese Clothing Costumes, Adornments & Culture. Long River Press. p. 7. ISBN 978-1-59265-019-4. Men's clothing in the Qing Dyansty consisted for the most part of long silk growns and the so-called "Mandarin" jacket, which perhaps achieved their greatest popularity during the latter Kangxi Period to the Yongzheng Period. For women's clothing, Manchu and Han systems of clothing coexisted. ^ Edward J.M. Rhoads (2000). Manchus and Han: Ethnic Relations and Political Power in Late Qing and Early Republican China, 1861–1928. University of Washington Press. pp. 60–. ISBN 978-0-295-98040-9. ^ Gerolamo Emilio Gerini (1895). Chŭlăkantamangala: Or, The Tonsure Ceremony as Performed in Siam. Bangkok Times. pp. 11–. ^ Lacouture, Elizabeth (2017), "Elizabeth LaCouture, Journal of Design History, Vol. 30, Issue 3, 1 September 2017, pp. 300–14", Journal of Design History, 30 (3): 300–314, doi:10.1093/jdh/epw042 . ^ Liddell, Jill (1989), J. Liddell, The story of the kimono, EP Dutton New York, 1989, ISBN 978-0-525-24574-2 . ^ Dalby, Liza (2001). Kimono: Fashioning Culture. Washington: University of Washington Press. pp. 25–32. ISBN 978-0-295-98155-0. ^ Sandra Lee Evenson (2014). "Hanfu Chinese robes". In Annette Lynch; Mitchell D. Strauss. Ethnic Dress in the United States A Cultural Encyclopedia. Rowman & Littlefield Publishers. pp. 135–36. ISBN 978-0-7591-2150-8. ^ "Keeping a Grip on Culture". Beijing Review. June 19, 2008. ^ "China launches first Traditional Garment Day". People's Daily Online. April 20, 2018. ^ "Similar yet different: Chinese and Korean traditional clothing". China Daily. October 30, 2015. ^ Sagart, Laurent. "The expansion of Setaria farmers in East Asia: A linguistic and archaeological model". Past Human Migrations in East Asia: Matching …: 137. ^ Kevin (2015-08-23). "2015 Hugo Award Winners Announced". The Hugo Awards. Archived from the original on 2015-08-24. Retrieved 2017-08-06. ^ Ferguson, Ben (7 October 2009). "'Master of Light' awarded Nobel Prize". The Independent. ^ "Qian Xuesen". The Daily Telegraph. 22 November 2009. ^ "Chien-Shiung Wu". National Women's Hall of Fame. ^ "Dr David Ho, Man of the Year". Time Magazine. 30 December 1996. ^ "Min Chueh Chang". National Academy of Sciences. ^ "Chang Min-Chueh". Britannica Online for Kids. ^ Miller, Louis H.; Su, Xinzhuan (2011). "Artemisinin: Discovery from the Chinese Herbal Garden". Cell. 146 (6): 855–58. doi:10.1016/j.cell.2011.08.024. PMC 3414217. PMID 21907397. ^ Maugh II, Thomas (2 December 1987). "Discovered Human Growth Hormone : Choh Hao Li, 74; Endocrinologist at UC". Los Angeles Times. ^ "Choh Hao Li". National Academy of Sciences. ^ "Choh Hao Li". A History of UCSF People. ^ Wright, Pearce (11 December 2001). "Joe Hin Tjio The man who cracked the chromosome count". The Guardian. ^ Saxon, Wolfgang (7 December 2001). "Joe Hin Tjio, 82; Research Biologist Counted Chromosomes". The New York Times. ^ "News from the National Academies". National Academy of Sciences. 4 January 2007. ^ "Dr. Yuan-Cheng 'Bert' Fung". National Academy of Engineering. 2007. ^ "Consensus during the Cold War: back to Alma-Ata". Bulletin of the World Health Organization. 86 (10): 737–816. October 2008. ^ "China's village doctors take great strides". Bulletin of the World Health Organization. 86 (12): 909–88. December 2008. ^ Erica Fox Brindley (2015). Ancient China and the Yue: Perceptions and Identities on the Southern Frontier, c. 400 BCE–50 CE. Cambridge University Press. pp. 9–10. ISBN 978-1-316-35228-1. ^ Gyanendra Pandey; Peter Geschiere (2003). The Forging of Nationhood. Manohar. p. 102. ISBN 978-81-7304-425-0. ^ Sow-Theng Leong; Tim Wright; George William Skinner (1997). Migration and Ethnicity in Chinese History: Hakkas, Pengmin, and Their Neighbors. Stanford University Press. pp. 78–. ISBN 978-0-8047-2857-7. ^ a b c d Jacques Gernet (1996). A History of Chinese Civilization. Cambridge University Press. p. 8. ISBN 978-0-521-49781-7. ^ Shmuel Noah Eisenstadt; Wolfgang Schluchter; Björn Wittrock. Public Spheres and Collective Identities. Transaction Publishers. pp. 213–14. ISBN 978-1-4128-3248-9. ^ Nicolas Olivier Tackett. "The Transformation of Medieval Chinese Elites (850–1000 C.E.)" (PDF). History.berkeley.edu. Retrieved 12 December 2017. ^ John Lagerwey; Pengzhi Lü (2009). Early Chinese Religion: The Period of Division (220–589 AD). Brill. pp. 831–. ISBN 978-90-04-17585-3. ^ Historical Atlas of the Classical World, 500 BC–AD 600. Barnes & Noble Books. 2000. p. 2.25. ISBN 978-0-7607-1973-2. ^ Haywood, John; Jotischky, Andrew; McGlynn, Sean (1998). Historical Atlas of the Medieval World, AD 600–1492. Barnes & Noble. p. 3.21. ISBN 978-0-7607-1976-3. ^ Dean, Kenneth; Zheng, Zhenman (2009). Ritual Alliances of the Putian Plain. Volume One: Historical Introduction to the Return of the Gods. BRILL. p. 341. ISBN 904742946X. ^ Xu, Bin; Xie, Bizhen (2013). "The Rise and Fall of Nestorianism in Quanzhou during the Yuan dynasty". In Li, Tang; Winkler, Dietmar W. From the Oxus River to the Chinese Shores: Studies on East Syriac Christianity in China and Central Asia (illustrated ed.). LIT Verlag Münster. p. 270. ISBN 3643903294. ^ Ni, Hao. Travel Guide of Fujian. Travelling in China. DeepLogic. ^ Szonyi, Michael (2002). Practicing Kinship: Lineage and Descent in Late Imperial China (illustrated ed.). Stanford University Press. p. 27. ISBN 0804742618. ^ Zheng, Zhenman (2001). Family Lineage Organization and Social Change in Ming and Qing Fujian (illustrated ed.). University of Hawaii Press. p. 190. ISBN 0824823338. ^ Hugh R. Clark (2007). Portrait of a Community: Society, Culture, and the Structures of Kinship in the Mulan River Valley (Fujian) from the Late Tang Through the Song. Chinese University Press. pp. 37–38. ISBN 978-962-996-227-2. ^ Hugh R. Clark (2007). Portrait of a Community: Society, Culture, and the Structures of Kinship in the Mulan River Valley (Fujian) from the Late Tang Through the Song. Chinese University Press. pp. 78–79. ISBN 978-962-996-227-2. ^ Edward Vickers (2013). History Education and National Identity in East Asia. Routledge. pp. 191–. ISBN 978-1-135-40500-7. ^ Endymion Porter Wilkinson (2000). Chinese History: A Manual. Harvard University Asia Center. pp. 752–. ISBN 978-0-674-00249-4. ^ Yao, Yifeng (2016). Nanjing: Historical Landscape and Its Planning from Geographical Perspective (illustrated ed.). Springer. p. 95. ISBN 9811016372. ^ "Six Dynasties". Encyclopædia Britannica. Encyclopædia Britannica, inc. December 4, 2008. ^ Entenmann, Robert Eric (1982). Migration and settlement in Sichuan, 1644-1796 (reprint ed.). Harvard University. p. 14. ^ Shi, Zhihong (2017). Agricultural Development in Qing China: A Quantitative Study, 1661-1911. The Quantitative Economic History of China. BRILL. p. 154. ISBN 9004355243. ^ Hsu, Cho-yun (2012). China: A New Cultural History. Masters of Chinese Studies (illustrated ed.). Columbia University Press. p. 194. ISBN 0231528183. ^ Pletcher, Kenneth, ed. (2010). The History of China. Understanding China (illustrated ed.). The Rosen Publishing Group, Inc. p. 127. ISBN 1615301097. ^ Chinese journal of international law, Volume 3. Chinese journal of international law. 2004. p. 631. ^ Foster, Simon (2010). China's Pearl River Delta, Guangzhou & Shenzhen. Hunter travel guides. Hunter Publishing, Inc. ISBN 1588438112. ^ Marks, Robert B. (2017). China: An Environmental History (2 ed.). Rowman & Littlefield. p. 177. ISBN 1442277890. ^ Zhao, Zhenzhou; Lee, Wing On (2010). China's Mongols at University: Contesting Cultural Recognitio. Emerging Perspectives on Education in China. Lexington Books. p. 243. ISBN 1461633117. ^ Marks, Robert (1998). Tigers, Rice, Silk, and Silt: Environment and Economy in Late Imperial South China. Studies in Environment and History. Cambridge University Press. p. 53. ISBN 113942551X. ^ Herklots, Geoffrey Alton Craig (1932). The Hong Kong Naturalist, Volumes 3-4. Newspaper Enterprise Limited. p. 120. ^ Lai, H. Mark; Hsu, Madeline (2004). Becoming Chinese American: A History of Communities and Institutions. Volume 13 of Critical perspectives on Asian Pacific Americans series (illustrated ed.). Rowman Altamira. p. 11. ISBN 0759104581. ^ Lu, Hanchao (2005). Street Criers: A Cultural History of Chinese Beggars (illustrated ed.). Stanford University Press. p. 59. ISBN 080475148X. ^ Li, Dun Jen (1975). Street Criers: A Cultural History of Chinese Beggars [The civilization of China, Volume 1]. Simon & Schuster. p. 278. ISBN 068413943X. ^ Hurles, M; Sykes, B; Jobling, M; Forster, P (2005). "The Dual Origin of the Malagasy in Island Southeast Asia and East Africa: Evidence from Maternal and Paternal Lineages". The American Journal of Human Genetics. 76 (5): 894–901. doi:10.1086/430051. PMC 1199379. PMID 15793703. ^ a b c Wen, B.; Li, H.; Lu, D.; Song, X.; Zhang, F.; He, Y.; Li, F.; Gao, Y.; et al. (Sep 2004). "Genetic evidence supports demic diffusion of Han culture" (PDF). Nature. 431 (7006): 302–05. Bibcode:2004Natur.431..302W. doi:10.1038/nature02878. PMID 15372031. Archived from the original (PDF) on 2009-03-24. ^ Li, Hui (2008). "Paternal genetic affinity between western Austronesians and Daic populations". BMC Evolutionary Biology. 8 (1): 146. doi:10.1186/1471-2148-8-146. PMC 2408594. PMID 18482451. Retrieved 15 May 2008. ^ a b Karafet, Tatiana; Hallmark, B; Cox, M.P. ; Sudoyo, H; Downey, S; Lansing, J.S. ; Hammer, M.F. (August 2010). "Major East–West Division Underlies Y Chromosome Stratification across Indonesia". Molecular Biology and Evolution. 27 (8): 1833–44. doi:10.1093/molbev/msq063. PMID 20207712. ^ Wang, Xiadong. "Han Chinese dialect area by the distribution of the Y chromosome". Blog.ifeng.com. Wang Xiadong. Archived from the original on 14 July 2014. Retrieved 10 June 2014. ^ Yan, Shi; Wang, C.C. ; Li, H; Li, S.L. ; Jin, L (2011). "An updated tree of Y-chromosome Haplogroup O and revised phylogenetic positions of mutations P164 and PK4". European Journal of Human Genetics. 19 (9): 1013–15. doi:10.1038/ejhg.2011.64. PMC 3179364. PMID 21505448. ^ "World ancestry". admixturemap.paintmychromosomes.com. Retrieved 2016-02-09. ^ Chen, Jieming; Zheng, Houfeng; Bei, Jin-Xin; Sun, Liangdan; Jia, Wei-hua; Li, Tao; Zhang, Furen; Seielstad, Mark; Zeng, Yi-Xin; et al. (2009). "Genetic Structure of the Han Chinese Population Revealed by Genome-wide SNP Variation". The American Journal of Human Genetics. 85 (6): 775–85. doi:10.1016/j.ajhg.2009.10.016. PMC 2790583. PMID 19944401. ^ Zhao, Yong-Bin; Zhang, Ye; Zhang, Quan-Chao; Li, Hong-Jie; Cui, Ying-Qiu; Xu, Zhi; Jin, Li; Zhou, Hui; Zhu, Hong (2015-05-04). "Ancient DNA Reveals That the Genetic Structure of the Northern Han Chinese Was Shaped Prior to 3,000 Years Ago". PLoS ONE. 10 (5): e0125676. Bibcode:2015PLoSO..1025676Z. doi:10.1371/journal.pone.0125676. ISSN 1932-6203. PMC 4418768. PMID 25938511.